Posted by Tyler in DIRTT, Progressive Interiors, Services with 0 comments. “Sometimes where you think inspires what you think™.” That’s the belief that led this global packaging company to re-imagine its R&D innovation center, creating a bold, bright new space in an existing building. Extensive use of glass keeps offices and meeting rooms open and airy, while applied graphics provide privacy and visual variety. 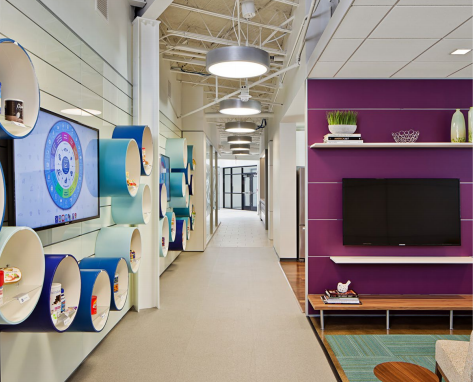 Write Away surfaces abound for brainstorming sessions; imbedded and hanging technology keeps digital tools handy and easily updatable; and a multi-antler wall with millwork provides an eye-catching and dynamic display space. If you are interested in this style and solution for your space, please contact us. Download the full PDF of this project here.